To mark Triple Negative Breast Cancer Day, BCRF recently met with two of its expert researchers in immuno-oncology to learn more about the progress and challenges of immunotherapy in triple negative breast cancer and other breast cancers. Dr. Robert Vonderheide, Abramson Cancer Center at the University of Pennsylvania has been an immunologist since his early training, and making it work for patients has been his life's ambition since medical school. BCRF: What are the challenges in developing targeted therapies for TNBC? Dr. Emens: Cancers that have a well-known driver pathway, such as ER or HER2-positive breast cancer, are the best candidates for effective targeted therapies. In the case of TNBC, there is not an obvious driver pathway to target. Another thing that makes TNBC more complicated is that it consists of a variety of subtypes, making it a very complex set of diseases that we are only just beginning to understand. Within each of these subtypes, there may be driver pathways that could be therapeutic targets, but as of yet, none have been well validated. BCRF: Is this tumor complexity the reason that we are seeing a less than 20 percent response rate of TNBC to immunotherapy? Dr. Emens: I think that's part of it, but the interaction between the immune system and the tumor is also quite complex. This complexity occurs both at the level of tumor biology and also at the level of regulation of the immune system and how they interact. Re-shaping this cross-talk to favor tumor response to immunotherapy will be critical to improve clinical outcomes. BCRF: What have we learned from the clinical trials in immunotherapy that could inform this approach in TNBC and other breast cancers? Dr. Vonderheide: We've learned two important things: 1) The immune system is part of the natural history of breast cancer, particularly TNBC; 2) The immuno-biology of breast cancer is not the same as melanoma, for example, and so the approaches that work for patients with melanoma may not work for most patients with breast cancer. I think in 2017 that we've reached the “end of the beginning” of cancer immunotherapy. By that, I mean that we now have multiple FDA-approved immunotherapy agents with more on the way which in some cases, lung cancer for instance, are superior to chemotherapy. That is an amazing development, and in many ways a “20-year overnight sensation”. Now we can look forward with the realistic expectation that under the right conditions, the body's own immune system can treat cancer. We are now rediscovering some of the immune therapy approaches that by themselves did not meet clinical efficacy previously, particularly in breast cancer, and looking to new combinations. Dr. Emens: We know that not all tumor types are the same and that every patient's tumor is going to be unique. For some tumors, the mutational load–the number of mutated genes within the tumor–may be important and for others that may not be as important. We're learning a lot about what we don't know about being able to predict which patients may respond to immunotherapy. We know that the presence of PD-L1 in the tumor microenvironment can predict response to immune checkpoint inhibitors. But, some patients without PD-L1 can also respond, so we need to know more about what is driving their tumor immunity. BCRF: What do we need to do to improve the response to immunotherapy? Dr. Emens: There are multiple reasons why a patient may not respond to these therapies. There might be multiple layers of immune regulation active in the tumor immune microenvironment, so blocking the PD-1 pathway, for instance, may not be sufficient to relieve the immune suppression. Some promising combination approaches are emerging that include combining PD-1 therapy with agents that target metabolic pathways in the tumor microenvironment. Another reason patients may not respond is due to a lack of T-cells in the tumor-immune microenvironment. In these cases, we need strategies to prime a T-cell response, such as, combinations of anti- PD-1 therapy with chemotherapy or radiation therapy. Another scenario may be that the T-cells don't have access to the tumor, so developing strategies to attract outlying T-cells into the tumor will be critical in removing this barrier to PD-1- targeted therapies. Those of us who have been in the immunotherapy field for a long time are enthusiastic about the possibility of combining vaccines with PD-1 directed therapies in order to jump start the immune response. We often use the analogy of PD-1 as putting the brakes on the immune system and anti-PD-1 therapy as taking away the brakes. A similar analogy of vaccines plus PD-1 -directed therapy would be using the vaccine to press the immune accelerator at the same time as taking off the brake with immune checkpoint inhibitors. It is very likely that the reason why vaccines have not been successful is that the PD-1 pathway is such a dominant pathway driving immune suppression, so that even with the vaccine-induced generation of T-cells, they are still held in check by the PD-1 pathway. Dr. Vonderheide: We think that vaccines will play an important part of immunotherapy in breast cancer, but not by themselves. 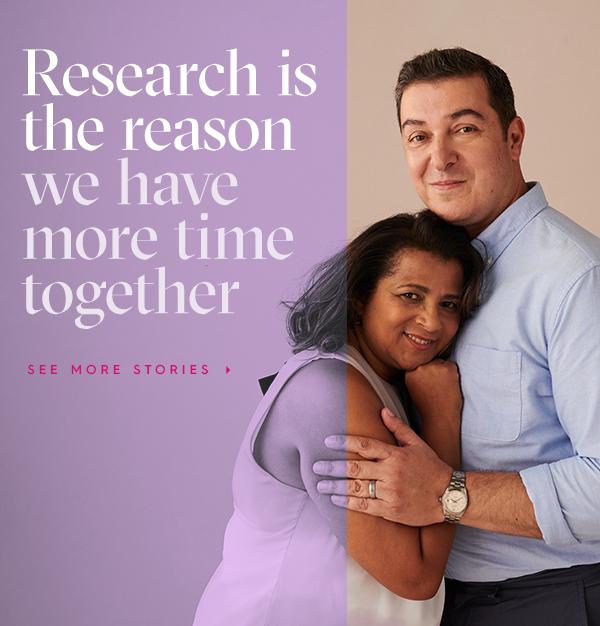 While clinical trials have not shown the type of efficacy in breast cancer that we know is possible, what they have shown is that with vaccines, we can re-educate the patient's immune system to recognize breast cancer cells and initiate an immune response. What we didn't realize during those first clinical trials was that the immune response generated wasn't sufficient. It needed help. Combinations of vaccine and checkpoint blockade are the next frontier in immuno-oncology and there is no better place to start than in triple negative breast cancer. BCRF: What's next for immunotherapy in breast cancer? Dr. Vonderheide: Over the last 5 years, we have witnessed the power of the immune system and have gained confidence that immunotherapy is a way forward, another tool in the fight against cancer, but it is very complicated. I think the new generations of immune therapies that will work in breast cancer will be combinations and will need to address the unique immuno-biology of breast cancer. Adding to that complexity, we don't fully understand how immune system responds to breast cancer and how responses vary from patient to patient despite being given the same medication. That will require immune profiling - understanding not only the mutations that are driving tumor growth, but also other mutations and gene abnormalities that may make the tumor more or less recognizable to the immune system. Immune profiling will help us to understand the immune landscape around the tumor, the immune cell types, and the surrounding tumor stroma. There is a huge discrepancy in how we understand the immune system in the research setting compared to how we measure immune fitness in a patient, which currently is typically just based on white blood cell count and differential. Imagine if we could understand, in real time, not only the gene mutations in a particular breast tumor but also all the information about immune activation and immune suppression. That information could potentially tell us how to tailor an immune therapy for that particular patient. We're already approaching this for patients with melanoma, but we have to work harder for patients with breast cancer. I think we'll know we're there when we can use immune profiling to predict which TNBC patients are likely to respond to checkpoint inhibitors and which aren't. This is happening in other tumor types, but we still need to do that work in breast cancer. Dr. Emens: I think it's going to be quite complex, but being able to personalize an immune therapy strategy to a patient's tumor in real time is going to be critical for the maximum benefit and greatest likelihood of success. Tumor biopsies at time of diagnosis and after immune therapy will help us to identify the biomarkers to predict which patients are good candidates for a particular immune approach and which are not, and help identify targets for effective combination approaches. Our hope is that we will find a profile within the tumor microenvironment that can also be detected by profiling the blood. Detecting a biomarker that can predict response to immunotherapy through a blood assay would reduce the need for tissue biopsies. In 2016, BCRF invested more than $13.5 million in studies to understand the immune biology of breast cancer and develop new immune therapy strategies for both treatment and prevention.